Some fans call episodes like this filler, but to me these are the real Steven Universe. Lore bombs are nice sometimes, but people sometimes forget that SU is essentially a slice-of-life show that has major revelations and events happen between. 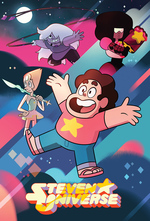 And better, it's a slice-of-life episode with Connie, Lapis and Peridot! * "Lapis, you don't remember me? You almost drowned me when you tried to steal the world's water?" "I almost drowned a lot of people." * "I call Garnet! I'm obviously best-suited for being the boss." "You are very bossy." "Thank you!" * Connie wearing Steven's shirt to get into character! * Sadie hanging out with Lars, looking rather angry. Did something happen off-screen? * Peridot: "Am I as aloof and distant as the Garnet??" Lapis: "You were... until you started to ask so many questions, ha ha!" (turns head, reveals hair is down over left eye Amethyst-style) Pumpkin: (barks, wearing party hat like Pearl's nose.) Also later, Lapis: "Whatever you say dudes. BUUURP!" * Connie running out in front of the others show-open style while an adjusted instrumental version of the theme plays. * Dissension in Beach City? What beef do people have with Mayor Dewey? * Peridot's metal powers have come along greatly! Apparently gem powers are something that can improve with practice? (My previous theory that just being on Earth empowers gems over time is another possibility, but I don't claim that this proves it by any means.) The four are actually really good at washing cars; I'm surprised there wasn't more collateral damage than the sign. If they ever need a source of income, they know where to get it. * If you pay attention, the dollars Buck hands Connie are 1s (2s are more commonly seen), and have the gemstone and snake symbols previously seen on show money. * Connie sleeping in Steven's bed while she watches the place. I guess she arranged with her parents that she was staying over? * Among the vehicles lined up the next morning are the Pizzamobile and Yellowtail's pickup truck, but also Ronaldo on a scooter. * Lapis (trying to do an English accent) "There is no Amethyst, only Garnet!" * Lapis: "Steven would have had a better speech." Peridot: "I know! She didn't even cry." * Connie: "It must be hard for (Steven) being the adult for a bunch of super-powered children!" That's Connie, summing up the whole show in a sentence! * Peridot and Lapis carry out the new sign between themselves. I don't know if this is innate gem strength; neither of them have shown themselves having high strength before, and Peridot was surprised, back in When It Rains, when Steven ripped open the Kindergarten access panel with just his hands. Of course Peridot could be helping to lift things with her metal powers, but she's not showing any effort like before. * The new sign looks pretty good! And the victory pose! But more seriously, notice that the show didn't star iris out. They tend to reserve that for important things. Could Connie, Peridot and Lapis form a kind of B-team in the future? Aw, I was a bit sad about the Lapis/Peridot bickering, but then I'm a filthy Lapidot shipper so you know, I'm a bit biased about that. I did like Lapis' ongoing lack of shits to give re. accidentally drowning people. I'm glad that's still a thing if you get her close enough to the sea. And that her signature music is still that creepy synth and piano. There's a lot of darkness in her, I'd hate to see it just magically go away. I did notice that Peridot's mental powers are really getting good. I share the opinion that Earth is a transformative place for Gems; it's probably why Yellow wants to blow it up rather then just raze the place. JHarris: That shot looked to me like they were holding hands while Sadie read a book. Am I misremembering? Yes, they do seem to be holding hands, you're right, I missed that on first viewing (it was only onscreen for a couple of seconds). They're trying to be nonchalant about it. If ever there was a couple that could pull off angry hand-holding, it's Sadie and Lars. Lapis, Peridot, and Connie are three of my favorite characters, since of all the primary characters they've had the fewest dedicated episodes. I like to see them get out and assert their personalities. Naturally, in this episode they try to act like other characters. I can't blame the two gems, though, since while being thousands of years old Peridot has never been anything other than a lowly technician and Lapis has been trapped in a mirror only to find the home she knew is long gone, replaced by whatever passes for Era 2 gem culture. They've never been free to do as they please so they model themselves after gems who are very used to self-governing. Then there's Connie, who adorably covets Steven's lifestyle to the point of enthusiastically trying to fill his shoes (and shirt (and bed)). I... guess I'm a Lapidot shipper? Mainly because I read Lauren Zuke's post explaining how she wrote Peridot's relationships with Lapis and Amethyst. I just like seeing the two of them interact, and Peridot bringing out the best in Lapis's dark personality. She even did a cute pose at the end! Anyway, please continue to give me Lapis and Peridot but especially Lapis, thank you. And Lapis does a way better Garnet than Peridot. Yeah, Lapis is easily the best impersonator of them all. Loved her Amethyst especially. Got to agree with you JHarris, this episode was pure SU. Like fanservice we didn't even know we wanted! Excellent, excellent episode, I laughed with delight at so many of those little details. I also loved that The Joke (well, A Joke) is that if Peridot should be covering anyone it should be Pearl, but she simply can't recognise that. Huh. Having it confirmed that Peridot is thousands of years old too (she always seemed fairly young for a gem), makes her glee at the discovery of (then meagre) metal powers make even more sense. She's had this thing about herself that she didn't know for a long, long time! And she's growing in ability now too! Been a while since I read comics, but that idea makes me think of the "secondary mutation" concept that Grant Morrison (I think) introduced to the X-Men, e.g. Emma Frost developing her diamond form along with/contrasting her psychic powers. Saying that though, in-universe, it fits perfectly with the idea that Earth/Freedom/Rebellion allows the gems to discover the true extent of their selves and abilities. That's something which the Crystal Gems have attributed to Rose Quartz but which may not actually come directly from her (can you tell I love/anticipate tweeests?). It also in a way would explain the entire nature of Rose, and her motivations for rebellion. Perhaps the special function of a rose quartz is to care and protect. They would have been designed that way to serve pink diamond, presumably, but when Rose went to Earth maybe her gempathy got supercharged and extended to all life on the planet? It's a thought anyway, and would also explain why Steven is so Steveny. Peridot might not actually be thousands of years old. I can imagine a conversation where Lapis says something assuming they're both thousands of years old and Peridot goes along with it because she wants to impress Lapis. Peridot's an "Era 2" gem, which we all assume means post-rebellion, so chances are she's significantly younger than our Amethyst, who we know came out after the corruption weapon was unleashed on Earth and "500 years" after the other Amethysts. Lapis, meanwhile, is a solidly Era 1 gem who could theoretically be the oldest gem we've met (other than the diamonds) but is probably similar to Pearl/Sapphire/Ruby in age. Connie's lifespan is negligible in comparison, but Lapidot could be a real May-November romance. I recall That Sugar Woman mentioning somewhere that Peridot is the youngest of the gang (a convention interview somewhere, I'd look it up but I don't have a clue which city). Given that Pearl considers "a few thousand years" to be young by Gem standards (in Sworn to the Sword) it's feasible that *both* things are true. Peri might be the baby of the group, at a piddling two thousand. She's no older than the end of the war though, so 5000's our upper limit. That would make her about the same age as Amethyst, probably a bit younger. It shows in the way they behave, too - both are a bit more open to new experiences and ideas than the others. Lapis is totally old as balls though. Pearl is somewhere in the vicinity of seven or eight thousand (from the 6000 years of the war + the two thousand at least mentioned in SWTS), Garnet's age is hinkey because she herself strictly speaking has only existed for 5750 or so years, but Ruby and Sapphire are older. I'd put money on Saffy being quite a bit older than that. It's totally possible that Lapis is the oldest of the lot. She'd have to have a bit of seniority to be brought along with Blue Diamond's court (she's seen in background in The Answer, as a courtier) rather than being out in the feild terraforming things with her high pressure mind hose. So, you know, she'd have to have been around a bit. So yeah, May December. It's good for them both I think - Peridot's openess tempering that darkness in Lapis, and Lapis' calmness and lack-of-fucks reigning some of Peridot's arrogance. They're good for each other, I think. Lapis crushed Peridot's tape recorder with one hand pretty easily in "Barn Mates". Peridot seems to be weak by Gem standards, but there's still a good chance she has super strength compared to a human. I mean, Pearl is way stronger than a human despite being intended mostly for decoration, and I don't get the impression that's something Gems can change much in their base form. Peri's also vain enough to use her metal powers to hide the fact she's not really up to lifting the sign with her spindly arms alone. Just chipping in to say episodes like this--"filler" like this--are what I love most about this show.